I’ve been daydreaming about having a dumpster in my driveway. It’s not the first time in my life I’ve had such a fantasy. I was desperate for a dumpster after my ex-husband and I got divorced. He had packed up a few boxes of essentials and moved into a lovely, spare apartment. In some ways I was lucky. I was staying in the house until we decided what to do with it. If I needed some random thing, there was a good chance it was there. For instance, I had drawers full of those odd kitchen supplies that you need every so often, like lemon zesters and rolling pins. But in another way I felt immensely unlucky. An entire house full of stuff was pressing in on me, reminding me it would all need to be dealt with eventually. It was making me feel claustrophobic. The house was still full of things that completely belonged to him, and were just waiting to be retrieved. It was also a house full of sadness and memories. I envied my ex-husband for what (at least on the surface) looked like clean slate. When we decided to sell the house about eight months later, my ex and I had to get together to deal with everything—trying to divide things fairly, deciding who would take what. After we dug into all of those old wounds and went our separate ways, each with half the libraries and music collections we once had, I was left with all the crap no one really wanted. This is when the dumpster longing became intense. The dumpster fantasy isn’t a very healthy one. I realize that. It’s true, you can have a dumpster delivered, throw a bunch of stuff into it, and then watch it get carted away. It seems like a fine choice. But it isn’t the responsible one. This is where the post could turn into an environmental tirade, so I’m going to steer it away from the physical stuff, toward that emotional stuff we’d just like to toss in a dumpster and walk away from. That’s very tied into what was going on with my ex husband and I, anyway. When something is messy and hurtful, we’d love nothing more than to walk away from it for good. But I just don’t think that kind of emotional dumpster service exists. I think we can pack things up in boxes and store them in the attic or a dank corner of the basement, but at some point those boxes still have to be dealt with—if not by you, then by someone else. On Monday I got an email from an old friend—a woman who was one of my few close friends in this town after I moved here in 2001. I hadn’t heard from her in more than six years. As you can probably guess, our friendship ended in a bitter, angry way that I have felt hurt by ever since. In the six years that have passed since our face-to-face encounter, that former friend has moved away and my life has changed in significant, wonderful ways. Whenever I’ve thought of her, with a prick of pain, I brushed it off. I had decided that particular loose end wasn’t important—it didn’t really matter. But now I realize I hadn’t really walked away from all that. It was still in my possession, packed away in a box in the basement. Now, with this email I received, I can look at the contents again, and give them some air. Beautiful post, Kristin! I have one or two relationships that I’d like to throw into the emotional dumpster sometimes…but you’ve reminded me not to lose hope. I’m loving your blog. The more I read, the more of a fan I become. Looking forward to meeting you soon! Apologies from friends can be wonderful. I so hope this is a new beginning for you, or at the very least, you can cross the bitterness off your list. I had a horrible falling out with my best friend in college. We lived together and did not speak to each other – for months – and didn’t even say goodbye when we moved out. Several years later, we ran into each other at a concert. We both immediately started bawling our eyes out and each apologized to the other (and still do sometimes). It has been the biggest blessing that she came back into my life. Good luck to both of you. Working through the compost, sorting out the broken bits is more healthy, but it TAKES LONGER. How wonderful that after six years your friend apologized. That sort of thing is hard. I am letting go of some boxed up attic memories, but maybe some one will mail them back to me painted pink someday. Wow, how wonderful. What a gift. Blessings to you both. I feel like this post is a great example of resurrection in everyday life. Your insights about the non-existent dumpster are spot-on. There comes a point when our only options are suppression or healing. Perhaps we need suppression for a period of time, but in the long run, healing is what we need most of all. Thanks for sharing so personal a story. Kristin, I’m really, really glad it was a sincere apology. Emails like that make my gut ache. I’m so glad yours was straightforward and genuine. You’re right: Packing away emotional pain and putting it in the basement doesn’t really make it go away; it’s still in our possession. I hope the apology makes you a little bit lighter. I bet the apology is just what you BOTH needed. I bet the sender needed to let go of her packed-away pain, too. Your experience is a good reminder to apologize, even when it’s hard. ….And forgive, even when it’s hard. I have a question though: How do you let go of the boxed-up pain when the other party never apologizes? Or, when you hear from the other party–but it isn’t an apology? Nice metaphor (and cool photograph too)! The kinds of experiences you describe here can have such a surprising healing effect–healing things we didn’t even realize that were wounded. So glad you had (and are having) this experience. Thanks for sharing! I’ve got all kinds of boxes like this in my basement. I only hope I can get rid of them in the way that you have, here. This is beautiful. Interesting. That’s why I contacted you out of the blue after 15+ years. Needed to get rid of the box…just didn’t know how to do it. Love it! In New York, freegans and dumpster diving is not uncommon. Freegans, often white-collared professionals who have money, dig out food being wasted and discarded. Bags of bread just baked at the bakery and not sold. Dented cans at the grocery store. Packaged sandwiches from the coffee shops. While I haven’t gone scouring for food, I have in fact taken coffee tables, artwork, and chairs from the street. The day the kids at NYU move out is a popular day, people find everything from books of stamps to iPods in their dumpsters. When I moved out of my last apartment, I put a ‘curb alert’ on craigslist and was delighted to see people driving up in vans hauling away our decaying dresser and desk. Bear with me here, I have a point! I tend to think ‘garbage’ and a dumpster is just a holding tank. It takes your things, once of value, and says, I don’t need this anymore, I release it to the world. You toss it aside, but it stays with you in spirit if it really meant something to you. It goes to the street, maybe someone finds it and repairs it and makes it new. Maybe it decomposes and goes back to the earth, only to come back to you in another form. I like your dumpster analogy. And it reminds me that at the end of the day, our emotional dumpsters are just a holding tank, sifting through the ‘stuff’ until we’re ready to process and see its real value, and send it back into the world. Wow, Susan–I really, really love what you’re saying. Something will stay with us because, at one point, it meant something. We don’t really remain hurt because we hold grudges–but we often remain hurt because the relationship that did the hurting was once really important to us. If the relationship wasn’t so important to us, it wouldn’t hurt. Wow. As I read this, I have a sincere apology in my draft section in my email box. I was contemplating sending it. I wanted to offer healing to my friend, but didn’t want to open a wound from the past. After reading this, I will send it. Thank you! Another beautiful reflection. I’m touched by the ending, that spirit of, maybe there is something of value here after all. It’s that moment of the second look, of rediscovery. i think it takes courage to reopen and rediscover relationships even when there hasn’t been a dramatic or bitter ending – it’s just vulnerable to say – hmm….maybe there is something here worth revisiting. Anyway, this leaves me wondering what it would be fruitful to rediscover or recover in my own life. Rachel, I think there is a lot about timing that we don’t understand, no matter how logical we try to be, and how much we try to compare one situation to another. If you had asked me five years ago, I would have said it was too late for this friend to apologize—that it didn’t matter at that point. Now I realize we just have to trust more and hang on to hope. Thanks for your kind words about my blog—I’m really looking forward to meeting you, too! Laura, I was going to say I can’t imagine living with someone you’ve had a falling out with, but then I realized that’s very similar to what it feels like to live with your husband after you’ve decided your marriage is over (which often happens, at least for a short while)! Not fun. I’m so glad you and your friend were able to serendipitously run into each other and make amends. sarah louise, yes, doing things right usually *does* take longer, doesn’t it? (Just yesterday I said to one of my daughters “haste makes waste.”) I love your compost reference, too. The world is just full of wonderful metaphors for life. ed, you’re exactly right—this is an Easter season post! And while I didn’t make it an overtly spiritual reflection, I certainly believe that God has been busy at work in her heart and mine all this time. erin, you would have to go and ask a tough question! Hmm. I guess what I would say from this experience is that packing up something you can’t deal with at the moment and putting it in the basement can be a healthy, healing act, not just a lazy, act of denial. It allows you to let go of something for the time being, and not have to look at it every day, without completely getting rid of it forever. If it’s in the basement but still really difficult to forget, perhaps it needs to be sorted through. A conversation with that person? Or with a pastor or counselor, maybe? I don’t know, that’s a tough one. An apology well given and well received – there’s so much beauty in that alone. So much to learn as we journey along, I suspect being open to what either opens or blocks a path is a huge part of the process. It can be so confusing and cyclical too unfortunately. I know I am cycling around too much right now. 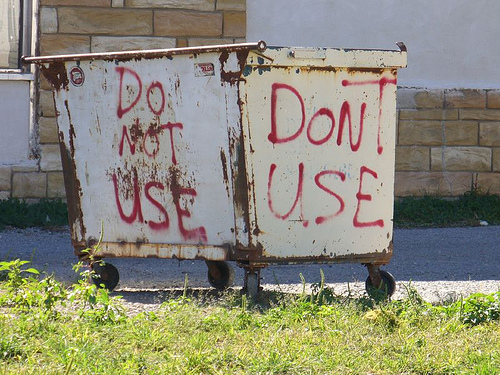 Some stuff I still want to dump, despite your dumpster analogy :-) Though I see problems or what have you cant be ‘taken away’, I am finding it useful to box some of them, in a way to prioritize what needs to be dealt with first. Will have to remember to not let those unpacked boxes fester in the basement though… thanks for your great layout of thoughts. Leslie, thanks for being glad for me! :) I guess that’s the danger inherent in packing away our hurts—we might convince ourselves they’re gone, even though we’re still being affected, in some subtle way, by that loose end. I do feel much lighter (I suppose part of that could also be the result of having my taxes out of the way for another year!). Amy, how big is that basement of yours? Is it cavernous? This is when my metaphor could start getting annoying. I’ll just say that I very much hope you will have opportunities to take care of these loose ends when the time is right. Joy, that’s so exciting to hear. This is what I love most about blogging—the opportunity to collaborate in our ideas and in our lives, and the fact that something that happen at Halfway to Normal can have a very real reverberation out in the world somewhere. Blessings as you carry through with that email! Tara, I love how you phrased this: “It’s that moment of the second look, of rediscovery.” I am definitely inspired now to think about what else in my life might be ready for a second look. Trina, yes, there is lots of beauty in that kind of exchange. I only wish it wasn’t so rare (and I am certainly guilty of not always handling broken relationships in the best way). I have found that one of the best things about being in the 35-40 age range is that there is more to learn and discover than ever. Every part of life seems new, not tired and old! Is that typical of middle(ish) age, or have I finally just decided I’m ready to be more open? Ah well, if we all did everything so perfect in relationships there wouldnt be this blog nor the readers I guess haha. It certainly is great to experience how age doesnt limit life, that message is sooo old. I would suggest some are still closed minded no matter the age, and likely miss so much. Cheers to all of us! You know that I’ve been going through the separation thing, too. As with your story, my husband took his few prized possessions and left to live in his own apartment. Last week, when I had to handle purging, packing, and moving on my own, I was so overwhelmed. Not only the enormity of the task before me alone, but the fact that so much of it was draining me. I tossed so much into the dumpster that had lost it’s value. And so much was tossed into the dumpster that hurt my heart to look at anymore. But I am holding on to one thing… the way my husband treated me in all of this. I can forgive him for being a wounded human who never knew how to deal with the situations that come up in life. What I will not toss out is the memory of how I was disrespected. How I was tossed away as if I had so little value. I don’t plan to let a grudge harm my heart… just as I won’t allow myself to forget that this is who he is and I do not deserve such pain. That thought will keep me from ever thinking there is anything to salvage when he inevitably shows back up as he always does. It reminds me of this song, “All Right Here” by Sara Groves, in which she says, “But I’m not God I’m a girl I confess and I don’t have a sea of forgetfulness and it’s all right here” or something like that… so true so true. I really need to think about this some more, because I think I pretend none of my wounds matter any more and that I’m quite alright, thank you. But maybe I have there are some apologies in my life that are waiting to be said or received. This is the first time I’ve visited your blog and I feel smack right at home. Because I am also neither here or there. I love it. Just love it.